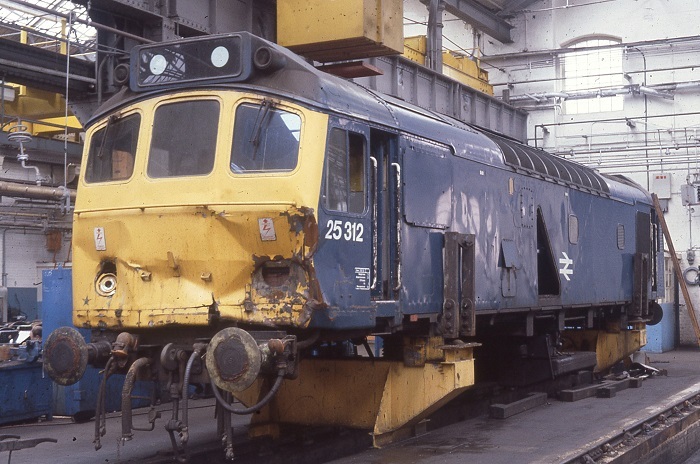 This view shows 25312 at Derby Works in June 1982, being stripped of all useable components. The fifteen year seven month career of D7662/25312 was spent allocated to a handful of depots, including a lengthy time in the London area. Time between withdrawal & scrapping: 38 months. December 1968 to Birmingham Division (D02). May 1970 to London Division (D01). May 1973 to Cricklewood following the abandonment of the LMR Division allocations. 25312 was the 131st Class 25 withdrawn, one of three retired during June 1982. 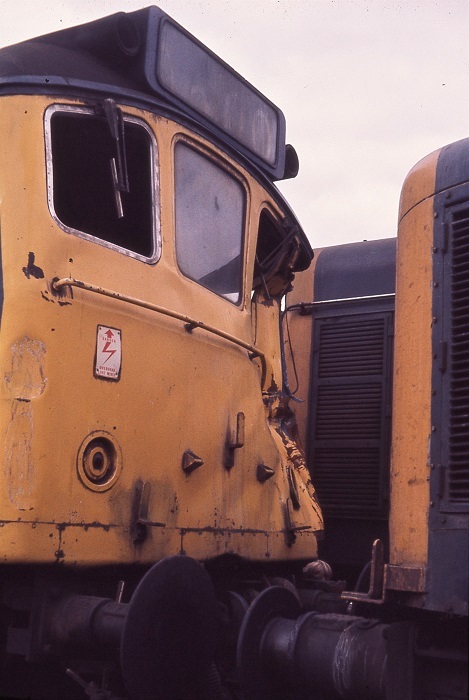 25312 was withdrawn after sustaining collision damage at Northampton during May 1982. It was briefly stored at Bletchley, then moved to Derby Works on May 25th 1982 where it was withdrawn. 25312 remained at Derby Works until moved on July 24th 1985 to Swindon Works in a convoy of withdrawn locomotives. It was scrapped at Swindon Works during the third week of August 1985. Noted Derby Works September & October 1976 (its last Classified?). Noted Derby Works August 1981 (N4 repairs). D7662 was new from Derby Works during November, being delivered to the London Division (D01). 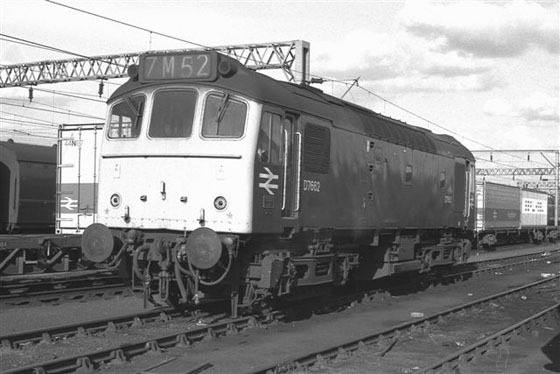 This was part of the final batch of locomotives built at Derby after Beyer Peacock failed to complete its intended order after filing bankruptcy. These final eighteen machines were delivered in blue with full yellow ends, although it took Derby Works a little while to get the positioning of the numbers, emblem and warning panel right. On April 16th D7662 was noted motoring down the LSWR mainline at Wimbledon with a troop special. Photograph courtesy Tom Sutch D7662 in original condition sometime during 1968, although the locomotive is a little work weary, its in the condition as delivered from Derby Works with two sets of numbers and emblems on each side and with full yellow ends. Behind the Class 25 is a set of Freightliner wagons, one of the positive innovations of the Beeching era. During December 7662 - 7665 were moved to the Birmingham Division (D02). A move back to the London Division (D01) occurred in May, as a Willesden based locomotive 7662 was observed on the Southern Region trip working 8M83 Hither Green - Willesden freight during October, with a visit to Derby Works taking place in December. On May 30th (Bank Holiday Monday) the Derby - Llandudno ran behind 5274 & 7662, neither being D16 allocated locomotives. 7662 was transferred to Cricklewood during May, and then back to Willesden during June. Ascot Week found a number of specials arriving in the hands of Class 47's, however two specials from Manchester Piccadilly received Class 25's between Willesden and Ascot, 7523 & 7530 on June 20th and 7645 & 7662 on June 21st. It was back to Cricklewood during March and then to Willesden in May. 25312 was transferred to Cricklewood during June. 25312 was noted at Derby Works during October. 25312 with damaged cab at Derby Works September 4th 1976. As the year closed 25308 - 25313 were moved to Toton. With so much time spent at London depots, the passenger workings for 25312 were few, however its transfer to Toton for eighteen months provided increased opportunites for such work. On June 24th 25312 worked the 07.30 Nottingham - Llandudno Town and the 13.02 Llandudno Town - Nottingham. The next day (25th) 25312 & 25153 worked the 08.40 Leicester - Skegness and the 18.30 Skegness - Leicester. On August 5th 25312 & 25285 worked the Derby - Norwich - Yarmouth - Norwich - Walsall diagram. A maintenance dispute late in March brought many strangers into South Wales including a number of Class 25s. So noted towards the end of March were 25294 on the 14.46 Great Bridge - Llandeilo flats (21st), 25177 on oil tanks to Llandarcy oil terminal (April 2nd) as well as a number of light engine movements west of Cardiff, 25256 & 25312 (10th) and 25184 & 25194 (12th). During April 25312 was transferred to Cricklwood, six months later it returned to Toton. During the evening of August 125th 25312 & 25311 were noted southbound through Chesterfield with the return leg of a charter. For the fifth time in its career 25312 was transferred to Cricklewood, this would be its last transfer. On May 23rd 25312 & 25221 worked the 04.10 Shrewsbury - Aberystwyth and the 10.07 Aberystwyth - Euston to Wolverhampton. The next day (24th) the same pair worked the 08.45 Birmingham New Street - Aberystwyth via Bescot and the 18.00 Aberystwyth - Euston to Nuneaton. Photograph courtesy Tony Sayer Its April 24th 1982 as 25312 takes a break at Guide Bridge, attached to a line of the ever present Class 76s. The electrics were already withdrawn, 25312's adventures were almost over with just over a month left in service. During May 25312 was noted at Northampton with a damaged cab, it was moved briefly to Bletchley and then taken to Derby Works for examination. Repairs were declined and the locomotive withdrawn on June 13th. 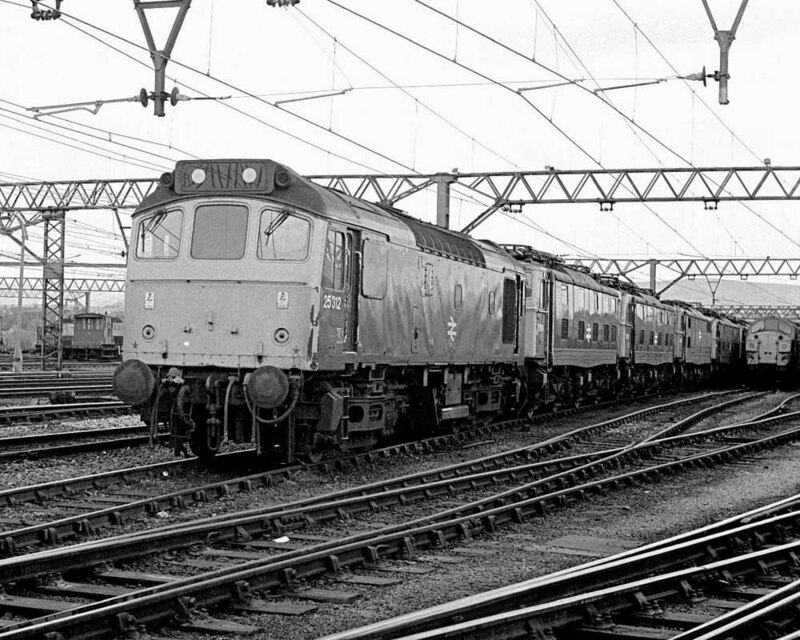 It remained at Derby to join an ever increasing number of other Class 25's, being moved into the cutting-up area, although cutting at Derby Works would cease before the scrappers could get to 25312. At some point whilst at Derby its power unit was transferred to 25308. With the ceasing of cutting up of locomotives at Derby Works three convoys of locomotives were moved to Swindon during 1985. The first pair of convoys occurred on February 4th & 5th with nine locomotives in each train. However it was the move on July 23rd that included 25312 and seven other machines running as the 9X12 17.05 Derby - Swindon hauled by 45060. This move then left Derby Works with only one Class 25 present, a partially cut up 25261. By August Swindon had done its work, 25312 being but a memory. Page added July 3rd 2004. Page updated July 27th 2018.